Maria Susan Rye was a social reformer born on March 31, 1829 in London, England. She was the daughter of Edward Rye, a solicitor and Maria Tuppen. Miss Rye was a leading figure in the mid-19th-century women’s movement in England, serving from 1855 to 1858 as secretary of the Association that promoted the Married Women’s Property Bill and from 1859, as a founding member of the Society for Promoting the Employment of Women. Eventually parting company with the Employment Society over an issue with suffrage, Miss Rye determined that there seemed to be an imbalance of unmarried ladies in Britain due to the emigration of more men than women. She argued that both Britain and the colonies benefited when gentlemen abroad were not obliged to marry beneath them. Between 1861 and 1867, Miss Rye traveled with parties of two young women of the Female Middle Class Emigration Society to Australia, Canada and New Zealand. By 1868, costs were rising and there was an adverse reaction to the emigration parties she had organized so Miss Rye had to consider ports nearer to Britain – Canada was the perfect solution. Criticism in the press and by public officials of the suitability, supervision and placement of the 200 young women she transported up the St. Lawrence River later that year led her to shift her attention to the emigration of children. 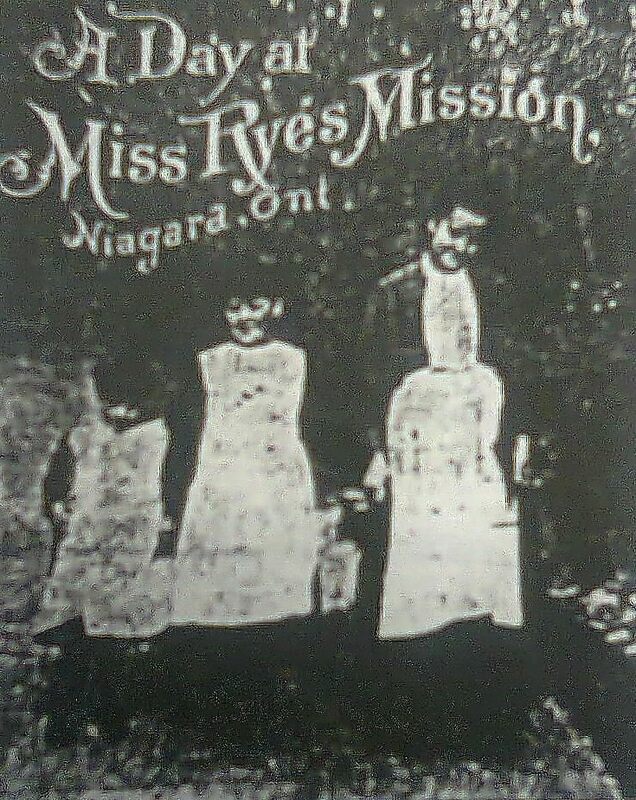 In 1869, Miss Rye came to ‘the rescue’ of Poor House and orphaned children, the work for which she is best known in Canada. 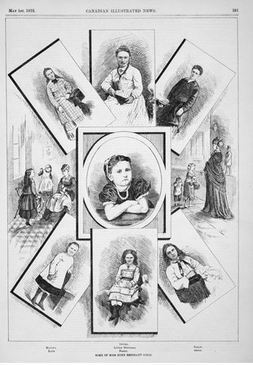 Between 1869 and 1896, her agency brought 3,623 female children to Canada. A large proportion of them were wards of the English poor-law unions which sponsored their emigration and placed them from the reception centre that she opened in a converted court house and jail in Niagara-on-the-Lake, Ontario. Of the 1,100 girls she brought to Canada before 1875, all but 200 were wards of the British state and Miss Rye hoped that the Local Government Board, responsible for workhouses and other Government-run institutions in England, would take over the program. In 1875, Andrew Doyle, an inspector hired by the Board, was sent to Canada to look more closely into the circumstances of children being ‘placed’ in Canada. In ‘The Doyle Report’ issued in February, 1875, Miss Rye’s placement methods were singled out as unsystematic and inattentive. Emigration ceased for a few years but then continued. Miss Rye had very supportive upper-class British allies including the Archbishop of Canterbury, Lord Shaftesbury and the Marquess of Lorne and his wife Princess Louise. 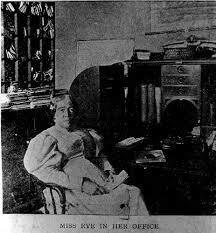 Miss Rye was not part of any Christian group although she was a devout Anglican, and kept away from Church policies. In her writing for the National Association for the Promotion of Social Science and in frequent letters to the London Times, she showed an uncaring attitude toward the children. 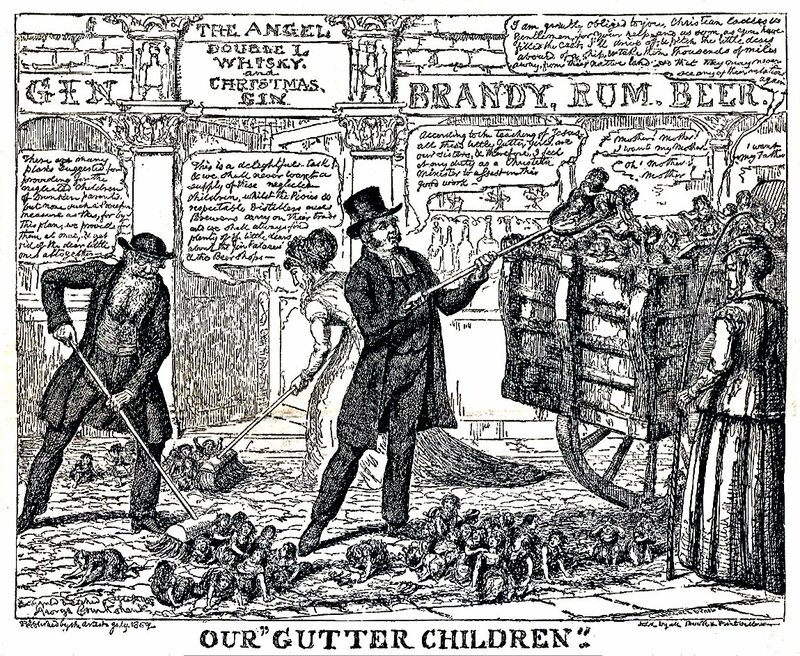 In one British newspaper, she was characterized by George Cruikshank, who had illustrated Dickens, as shovelling orphan children into a giant mud cart. By 1895, Ontario was beginning to examine the regulation of the juvenile immigration agencies. Miss Rye transferred her distribution centres at Peckham in London and Niagara-on-the-Lake to the Church of England Waifs and Strays. After retiring to live with her sister at Hemel Hampstead, Miss Maria Susan Rye died, a spinster, of intestinal cancer in 1903.